RIO DE JANEIRO, BRAZIL – Cameroon have been eliminated from the 2014 FIFA World Cup after suffering a 4-0 thrashing at the hands of Croatia at the Arena Amazônia this evening (June 18th). The result means Croatia’s final group game against Mexico takes on the shape of a cup final, with the winner progressing to the final sixteen. 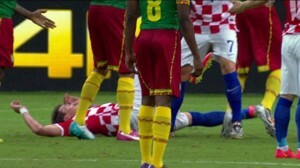 Mario Mandzukic lies on the ground after being hit by Alex Song, image recreation. Cameroon self imploded and lost their footing in the game following the dismissal of Alex Song. The midfielder needlessly lashed out at forward Mario Mandzukic and was shown a straight red card. The Cameroon side had actually started the game the better side and were unlucky not to take the lead in the early minutes. But they were dealt a sucker punch on eleven minutes when Ivica Olic, after combining with Mandzukic and Perisic, put Croatia in front. The goal seemed to relax the Europeans, who started to play the kind of football they had shown in the World Cup opener against hosts Brazil. Cameroon strived to re-find their form but on 39 minutes Song was dismissed and the game gradually slipped from their grasp. Two minutes into the second half Perisic got Croatia’s second after a powerful run and finish down the left flank. On the hour mark, Mandzukic put the game out of sight with the third, heading home from a corner completely unmarked. Cameroon went for broke, pressing forward in great numbers, but all they succeeded in doing was gifting space to Croatia. On 72 minutes, Mandzukic got his second and his side’s fourth when he tucked home the rebound from Eduardo’s curled effort. The final fifteen minutes were light entertainment for the crowd, with Croatia toying with their jaded opponents and going close to adding to the scoreline.